The dockless bike-sharing service LimeBike has introduced a number of new three-speed bicycles to the South Bend market, including the University of Notre Dame, as an addition to its existing fleet of fixed-gear bicycles here. At the same time, the company has launched “LimeRight,” an online video series aimed at playfully educating riders on how to properly access, ride and park the bikes. The first two videos, including a “Matrix” parody, address parking and safety. And the company has added important new features to its app, letting users report damaged, malfunctioning or improperly parked bikes with the touch of a button and generating helpful reminders about parking etiquette. The upgrades are part of an effort to improve the service for both riders and the public while further educating users on important issues of safety, including how to park the bicycles so that they do not impede traffic or otherwise become a nuisance or a hazard to pedestrians or motorists. Numbering about 500, or about 30 percent of the total fleet here, the new three-speed bicycles feature an easy-to-use thumb shifter, allowing for less strenuous riding over a variety of flat or sloping surfaces. Distinguished by their bright-yellow chain guards, the bikes also feature lighter spoked wheels, built-in lights, cell phone holders, reflective tire sidewalls and better baskets. Based in San Francisco, LimeBike launched in South Bend in July 2017, expanding to Notre Dame, Saint Mary’s College and Holy Cross College the following month. The company currently has 1,700 bikes in the area, including about 850 on campus. 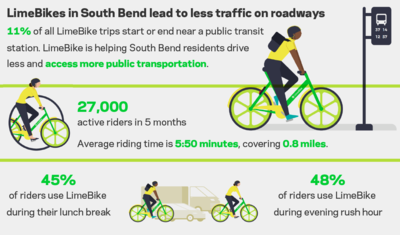 A leader in the quickly expanding world of dockless bike sharing, LimeBike counted 27,000 active riders in the South Bend market as of Dec. 31, including more than 5,000 active “.edu” riders, including Notre Dame students, faculty and staff. The company recently issued a year-end report that showed riders here pedaled a combined 85,000 miles from August through December, burning an estimated 2.6 million calories while reducing coal use and saving trees. About half of all riders here used the service during lunch or rush hour, the report showed, accounting for a combined 43 percent of all rides. Average ride time was 5:50. Average ride distance was 0.8 miles. Total rides for the area exceeded 250,000. Demand for the service has remained strong throughout the winter, according to Nathan Hasse, LimeBike South Bend operations lead, despite the frequent snow and bitter cold. John Mitchell, a graduate student in sacred music from Arlington, Virginia, is among the top LimeBike riders on campus. Mitchell pays $15 per month for LimePrime, a subscription service that offers 100 rides per month plus 50 percent off any additional rides after the first 100. He has logged more than 400 rides since the service arrived here in August — or about two rides per day on average. From a University perspective, the service provides an additional mobility option for students, faculty and staff while contributing to the University’s goal of becoming a more sustainable campus — less wasteful and less dependent on non-renewable sources of energy such as coal. “First, we’re encouraging individuals to use LimeBikes when possible to replace local vehicle traffic,” said Carol Mullaney, senior director of sustainability and continuous improvement at Notre Dame. “Reducing vehicle use is an important way that we can reduce our Scope 3 greenhouse gas emissions (a category that covers indirect emissions from activities such as commuting) and our overall carbon footprint. 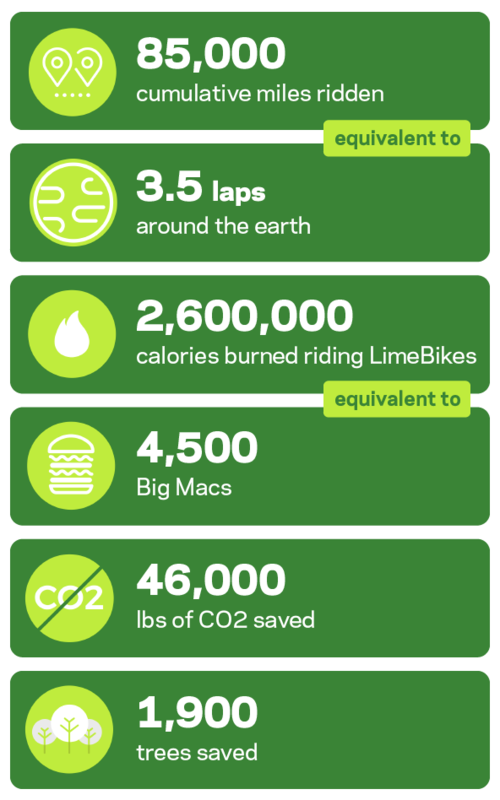 LimeBike is easy to use. Riders use an email address and credit card to sign up for the service. Rides cost 50 cents per half hour for students, faculty and staff, or $15 per month for LimePrime. Because the service is dockless, riders are not limited in where they can park the bikes, so long as they do not block car traffic, impede pedestrian access or encroach on private property. For more information, visit http://green.nd.edu/topics/transportation/limebike. Originally published by Erin Blasko at news.nd.edu on February 16, 2018.